This past month has been a whirlwind. Last time we checked in, we were about halfway through our Kickstarter campaign, and steadily on our way to our funding goal of $25,000. We were also fervently making plans for brewery construction work, and busy dreaming up new beers we wanted to make and recipes we wanted to perfect before opening. Since then, some cool things have happened. First off, we not only reached our $25,000 Kickstarter goal, but we also exceeded our Stretch Goal of $35,000! A huge heartfelt THANK YOU to everyone who helped out, especially the 207 awesome people who backed us! We couldn’t have been happier, and more surprised, by all the generous support! These funds will help us build the community taproom we’ve been dreaming about. The stretch goal funds will also help us get a forklift. We designed the brewery so that our dry storage is above the cold storage, as a way of maximizing space in the brewery, so the forklift will save us a lot of time and a lot of backache (at least for Jake!). 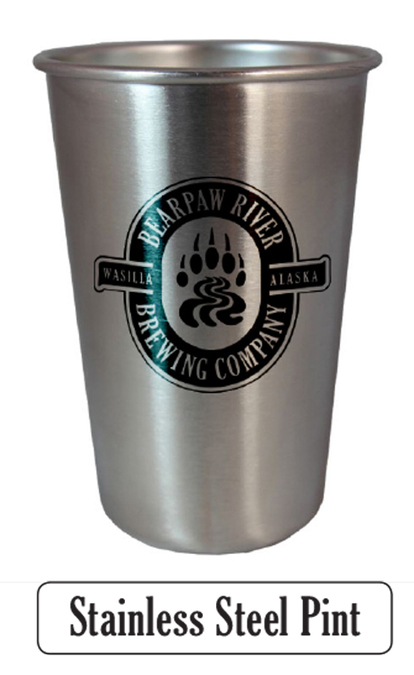 Since we made our stretch goal, ALL Backers will get a Bonus stainless steel pint, in addition to their chosen rewards. 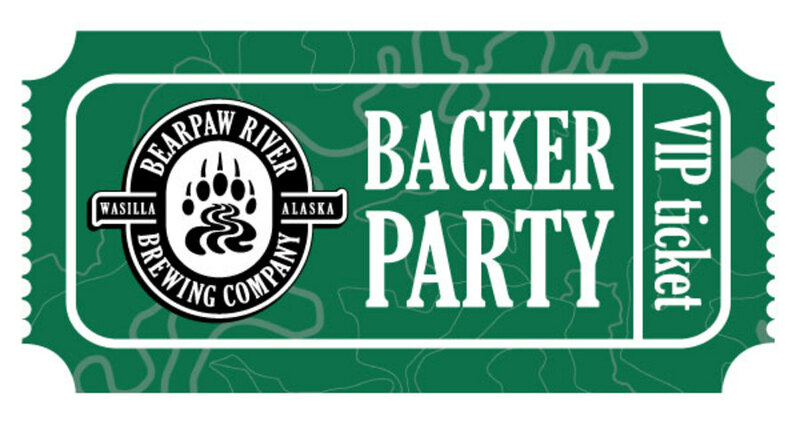 All backers are also invited to a Backers Only party! This will be a great chance for our 207 supporters to check out the new brewery and taproom, and be the first to try BRBC beer on tap! This party will be soon before we Officially open, but right now we’re not sure when exactly that will be. If you’re one of our awesome Backers, we’ll be in touch directly once we know a date for sure. We’ll also be in touch about your rewards. Stay Tuned! 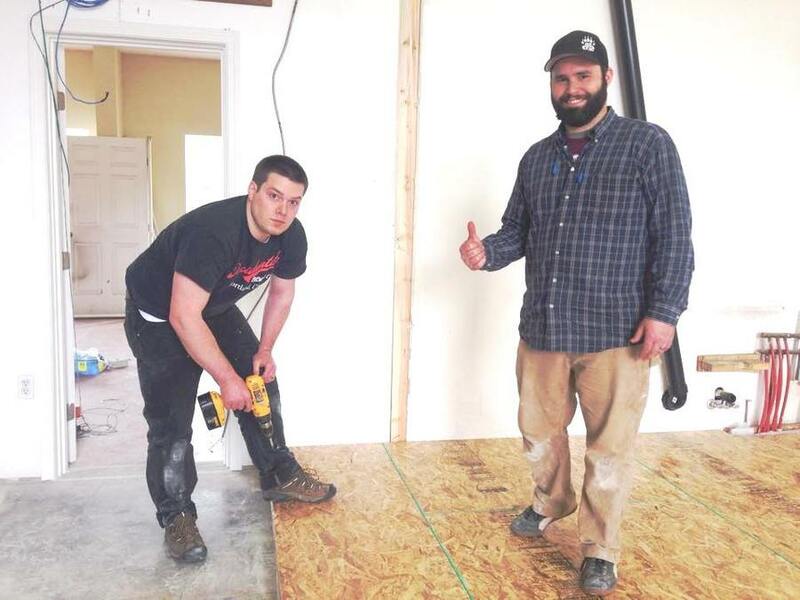 While the Kickstarter campaign was happening, we were also tackling construction projects in the brewery. 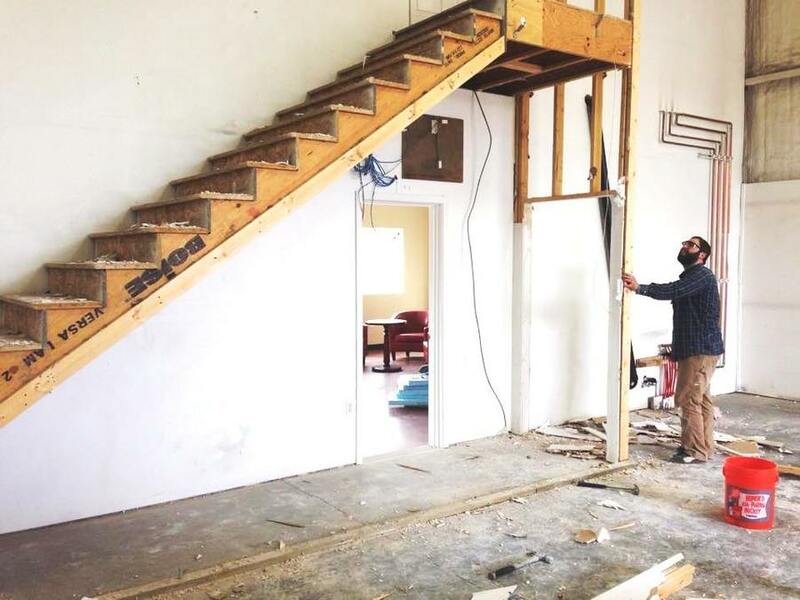 It started with demolition of the staircase from the brewery to the office. We then built the cold storage box, the future home of full kegs of BRBC beer, and on top of that the space for our dry storage and mill room. We’ll auger the milled grain from the dry storage directly to the grist case Jack is currently making in his woodshop. When the brewing begins, the grain accumulated in the grist case will drop straight into the mash tun. 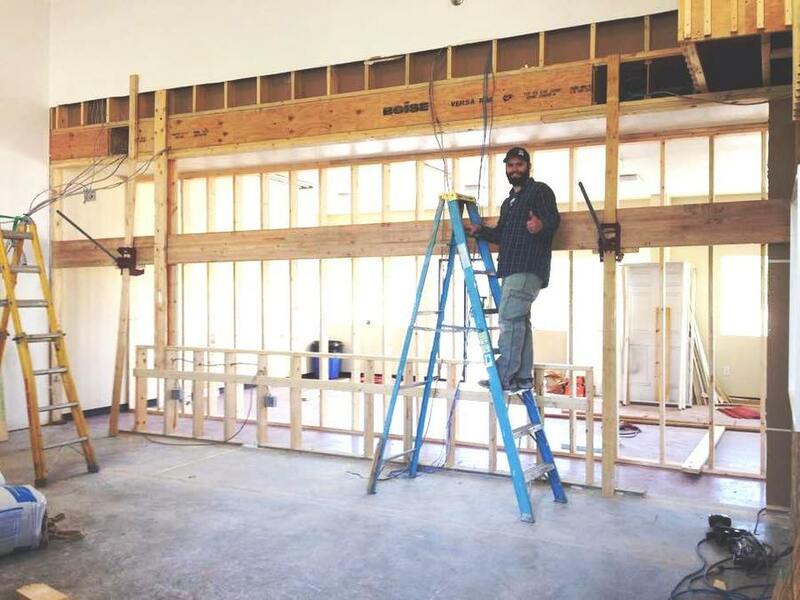 Other construction projects include the demolition of a section of wall separating the brewery and the taproom, and in its place the building of a new half wall. 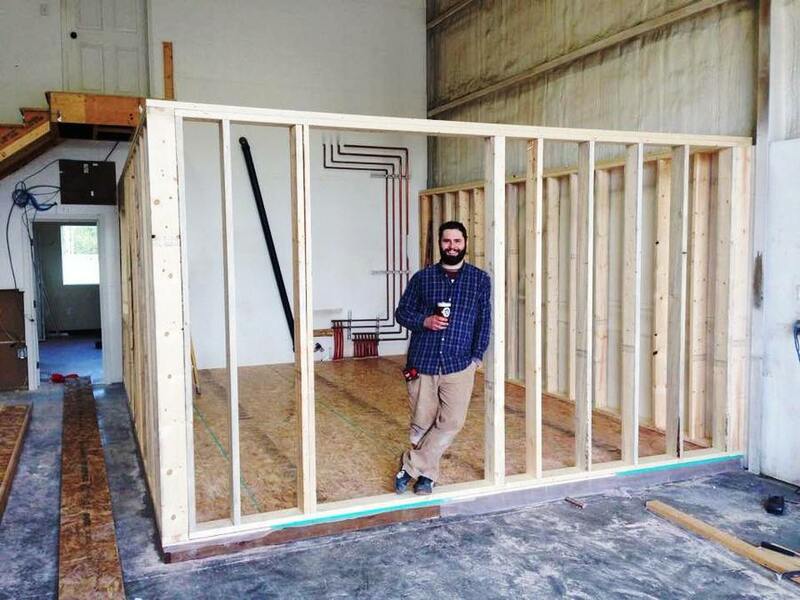 We also moved the door to the taproom bathroom, and built the frame for the bar. This is the first step in our taproom renovations! We haven’t neglected the brewing either. Jake and Jed have been working on refining existing recipes and experimenting with new ones. In their recent quests for new and increasingly tasty beer they’ve brewed our Milk Stout, our IPA (with Cascade hops providing all the aroma), a Belgian Tripel, and an American wheat. Some of the American wheat will get a heavy dose of blueberries as well. In upcoming brewdays we’ll be making our porter and our IPA again, and of course we hope to be firing up the big 10-barrel system some day soon!